Learn how to use a thermal cooker to cook a light and tasty soup with this Chinese sweet corn soup recipe. A delicious everyday soup. This simple and delicious soup is naturally sweetened by the sweet corn, dried honey dates, ikan bilis (dried anchovies) and pork ribs. It makes a great one-dish meal and I love to dip the pork ribs in some light soy sauce with bird’s eye chillies and eat it together with rice. Simply delicious! Usually, when I see them in the market, I will buy them to use in my soup. I used bi-color corn for this soup but regular corn-on-the-cob is fine too. 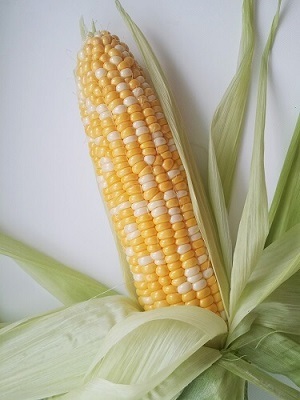 Sweet corn is also great as a healthy snack. My kids love to eat steamed corn with some melted butter and salt. Yum! 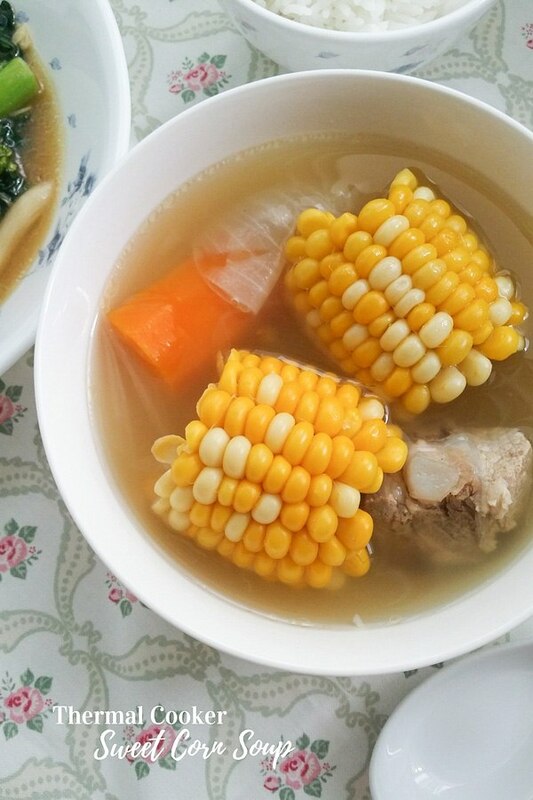 The main ingredients of this soup are the sweet corn and pork ribs. Please use fresh corn on the cob and not the frozen or canned type for this recipe. Tip: Corn is best eaten immediately after harvesting as the sugar in the corn will gradually convert to starch. So it is best to cook them as soon as you get them. The longer it is kept, the less sweet it will be. You may also add a few pieces of fresh Chinese yam if you have as they are very good for our health and will not alter the taste of the soup much. Chinese yam is used in Traditional Chinese Medicine to help digestion, relieve stomach pain, promote muscle growth and repair worn-out tissue among many other health benefits. Last year, I purchased my very first Tiger thermal cooker as I love the idea of an energy saving cooking appliance. A thermal cooker is a cooking device that uses trapped heat to cook food without the continuous use of any other heat sources. What can I say but I totally love this pot. If you have not heard of a thermal cooker before, it works like a vacuum flask whereby it can retain heat. And this pot can cook your food while saving energy. So far, I’ve used it to boil soups, porridge (congee) and desserts and I’ll be trying out new recipes in the coming weeks. I was surprised that the pork cooked in the thermal cooker is comparable and surprisingly as tender as those cooked using a regular stovetop pot. To learn more about the thermal cooker, click here. I usually serve this soup with some rice and vegetables and sometimes drink it on its own. To add a simple side dish to this soup, try the Chinese Broccoli with Oyster Sauce or Stir-Fried Kailan with Oyster Sauce. You can easily whip them up in 15 minutes or less while your soup is being cooked. Remember to cook the vegetables when your soup is almost ready so you can serve a hot dinner of freshly cooked vegetables and soup. 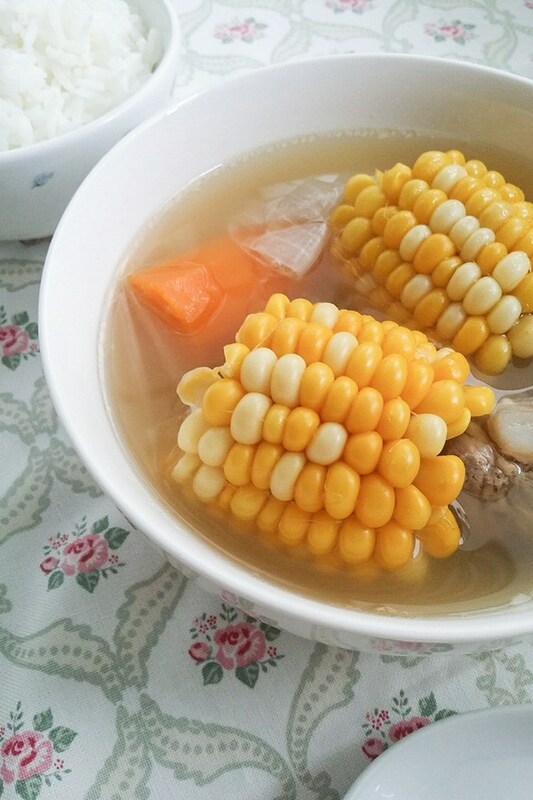 If you love corn, try these corn soup recipes too: Chinese Sweet Corn Soup with Chicken and Dried Scallop, Shrimp & Corn Egg Drop Soup and Beetroot and Corn Soup. Would you like to receive updates and the latest recipes from Souper Diaries? Subscribe to my newsletter and receive new recipes and updates delivered to your inbox for free! Connect with me on Facebook, Google+, Pinterest, Twitter and Instagram. See you next time and happy souping! 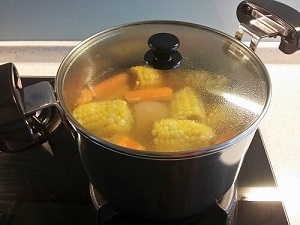 Save time and energy cooking this Chinese sweet corn soup with a thermal cooker. Delicious, fresh and light tasting. Bring a small pot of water to a rolling boil. Parboil the pork ribs for about 5 minutes to remove scum and dirt. Remove and set aside. Place the pork ribs, corn, red onion, ikan bilis, dried honey dates and water into the inner pot. Bring to a boil. Once the water boils, reduce the heat and let the soup simmer for at least 30 minutes or until 45 minutes. Turn off the fire and make sure the inner pot is covered with the lid. Transfer the inner pot into the outer pot. Close the outer lid and leave it for 2 hours for the trapped heat to continue cooking. After 2 hours, the soup is ready. Open the lid of the outer pot first. Then open the lid of the inner pot carefully. Season with salt if preferred. Serve immediately. 1. Pork ribs can be replaced with chicken if preferred. 2. If you're using a regular stovetop pot, follow the par-boiling method in step 1. Thereafter, place all the ingredients in your soup pot. Bring to a boil and then lower the heat and simmer for about 2 hours or until the pork ribs is tender. How do you adapt this recipe for a slow cooker instead of a thermal cooker? I only have a slow cooker at home and am dying to try this soup out! Hi SL, you can also use any type of soup pot for this soup. For slow cooker, you can cook it on low for 8 hours or till the meat is tender. Blanch the pork in boiling water before cooking. What a fantastic website 🙂 Love the “souper diaries” slogan. Isn’t a thermal cooker also called a crock pot? We have a crock pot that we use for tea as well and we could use it to make the soup. I’m going to pass this website on to my mum because she loves soups and it’s great to have a place where you can find them all in one! YUMMM! I love corn soup! Here in Canada we don’t get corn all year round because there’s seasons so when it’s in season I like to eat as much as I can. This is a great way to eat them! I always get bi-colored corn as well as I like the sweet flavor it has. My wife is originally from Malaysia and she loves ikan bilis (anchovies). I’ve never heard of a thermal cooker but looks like a great way to save energy. I have a question about it though. Is it similar to a pressure cooker? Does it cook faster as well? I think it’s pretty awesome that it comes with an extra lid to help keep the heat in. I’ve never seen that before! Will look into getting one. Thanks for another awesome recipe! Sorry for the late reply. A thermal cooker is not the same as a pressure cooker. Although both cookers can save on energy, there are differences. They work on different principles. 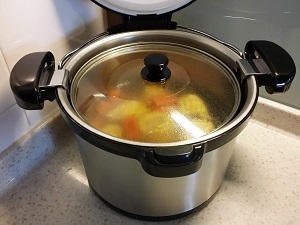 A pressure cooker uses steam pressure to cook whereas with a thermal cooker, it uses thermal insulation to trap heat and cook without continuous use of any heat source. 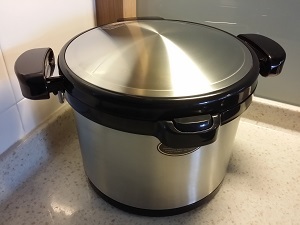 A pressure cooker will cook food faster if compared to a thermal cooker. Yes, the extra lid will help to seal in the heat to cook food. It is a very healthy way to cook and also energy efficient. 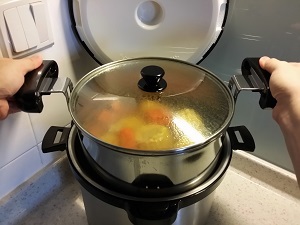 I am personally using this thermal cooker and you can also find a list of thermal cookers here. Thanks for writing in and happy cooking!